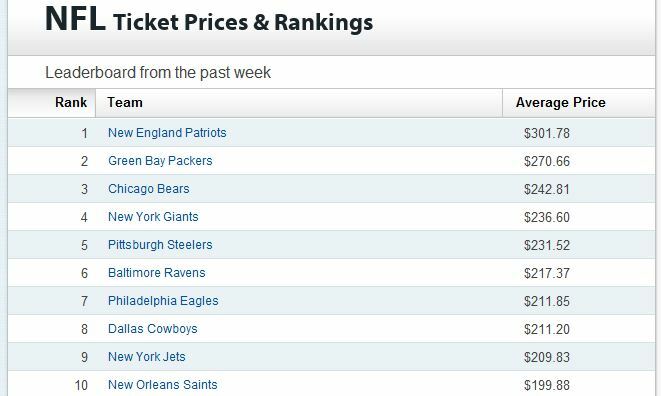 With the 2011-2012 NFL season just weeks away and demand for 2011 NFL tickets heating up, we have decided to do a quick weekly feature on the top 10 cheapest and most expensive NFL teams based on re-sale ticket prices. This will not replace longer form NFL analyses, which we will still put out as especially interesting trends surface related to NFL ticket prices. Below are the top and bottom ten teams over the past week. If you want to see how NFL tickets stack up against other events, check out our comparison of the most expensive tickets by event-type.